You Can Program Up To 60 Names And Phone Numbers Into The Dialer For Voice Recognition Recall. Corded Phone - Just Pick Up The Handset And The AP-5000 Will Ask You " What Name To Call"? Cordless Phone - Push The Speakerphone Or Talk Button On Your Cordless Phone And The AP-5000 Will Ask You " What Name To Call"? The AP-5000 Verbally Prompts You And Guides You Through The One-Time Programming Sequence. The AP-5000 Goes Between Your Phone And The Phone Line. Want To Dial A Number Not In Memory? Just Hit Any Key After The "Name To Dial" Prompt To get A Dialtone Then Manually Dial Your Number. Perfect For Persons With Vision Impairement Or Diminished Motion Control! Just Pick Up The Handset And The Phone Will Automatically Ask You What Name To Dial. You Just "Tell" The Phone What Name To Dial Without Ever Having To Push A Button!. The AblePhone AP-5000 has many exciting features for users of all types. It's one of FactoryOutletStore's best selling Amplified Cell Phone Accessories. You can extend the lifetime of your AblePhone AP-5000 with the purchase of a FactoryOutletStore Factory Protection Plan. See the AblePhone AP-5000 gallery images above for more product views. 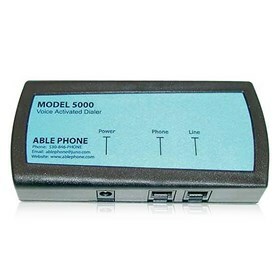 The AblePhone AP-5000 is sold as a Brand New Unopened Item.